Drunken bully cuts his wife's throat in a fit of jealous rage. 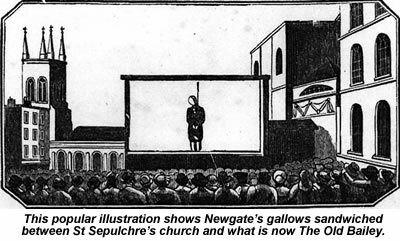 Bungles his own suicide attempt, and lives long enough to be hanged at Newgate. This A3 broadside, printed by Paul of Seven Dials, gives us seven verses above a long prose account of Mobbs' crime and execution. As with many such ballads, the verses are presented as the criminal's last confession, complete with a moralising conclusion warning others not to follow his sad example. Supposedly written by the condemned man, these “last goodnights” were actually penned by jobbing writers in the print shops round Seven Dials and sold on the day of the execution itself. The illustration is a very popular one, and appears on at least a dozen broadsides from the British Library's collection alone. It shows Newgate Prison on the right (now The Old Bailey, London's Central Criminal Court) and St Sepulchre's Church on the left. The artist's perspective puts him right outside what is now the Old Bailey's main entrance. St Sepulchre's is still standing, and those are the bells which we're told Mobbs heard on the gallows. I die upon a tree. Mobbs die upon the fatal tree. Than if they'd been her own. And cut my darling's throat. Oh Lord, receive my soul. Mobbs and his wife, Caroline, lived at 7 Enoch Court, off Goodman's Yard in Whitechapel, where they shared a single upstairs room with four young children from Nathaniel's first marriage. Both in their early thirties, but trapped in this area of notorious slum housing, they were far from a contented couple. After the incident with Scott, Mobbs went back inside number 7, where his family's room was sandwiched between John Reorden's room on the ground floor and the Lancaster family above. Reorden got home from work to find Mobbs shouting at Caroline in the room he - Reorden - shared with his father. Mobbs pushed his wife out of the room, yelling at Reorden's father not to let her in there again. “He appeared to be rather under the effects of liquor,” said Frances Lancaster. As soon as she could get away from Mobbs again, Caroline went up to the Lancasters' room, where she stayed for the next three hours. “From what she said to me, I allowed her to remain there until about half past nine,” Frances Lancaster testified. “Then I lent her a cloak to put on and she left the room. I saw nothing more of her after that.” Scott confirmed that she'd seen Caroline up in the Lancasters' room and then, later, alone in the courtyard. At about 10:00pm, she noticed Mobbs sitting in his window, with only the children for company. Julia Angling, who shared a room with her mother at 4 Enoch Court, took up the tale from there. “On the morning of the day she died, Mrs Mobbs was at my place,” Angling explained. “She had been there all night. She came about twelve o'clock at night, and remained until morning. She slept in my room. “About half past five on the Wednesday morning, the prisoner came to my place and asked if his wife was there. I stood before her to try to save her, to hide her, because she did not wish her husband to see that she was there. When he saw her, he asked her to go and get a pint of beer. She said would not go and fetch him no beer, because she was going up before the Lord Mayor in the day for proof - that he should not murder her.